Having worked in West Perth for coming on 6 years now its always exciting when somewhere new to visit pops up. Enter The Brown Fox. The newly revamped Onyx Bar has been getting renovated since late last year and finally a few weeks ago it opened its doors. And what an impressive job they have done. The new fit out looks great – wooden floors, pressed tin, fancy wall paper – and all very open and the open veranda with its aged metal balustrade was an inspired choice. It looks sort of olden days new, if that makes any sort of sense – trendy though, I liked it. And speaking of inviting, when my friend Helen and I rocked up for lunch the other day, the first thing that impressed us was the friendly greeting we received at the door. We were swiftly taken to our table in the dining section. Basically the restaurant section of the bar is in a series of tables along the front veranda and then the right hand wall, separated from the bar by ornate metal bars. So when we first sat down it did sort of feel like we were in jail. Sort of novel though and worked with the look of the place. 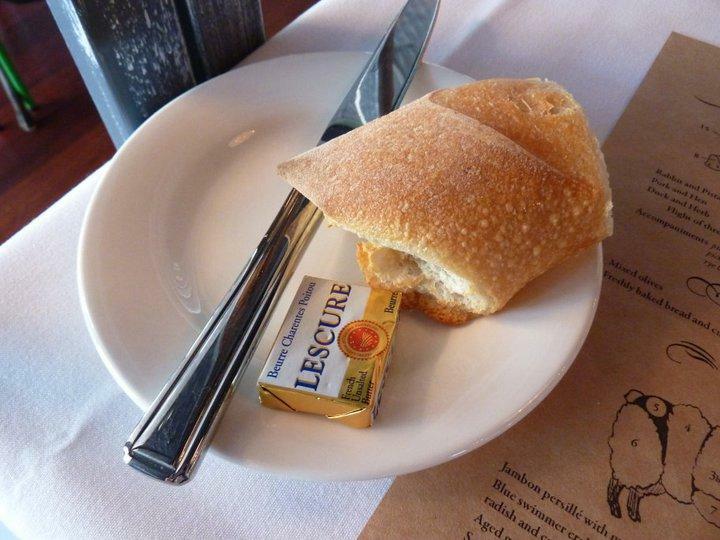 While we perused the menu we were each brought a bit of fresh, warm baguette with (some of my favourite) Lescure butter. This was a wonderful touch I thought. Before placing our orders Helen had a few queries and again, our waiters knowledge of all the dishes was excellent. Particularly with regard to which of the sauces that came with the steak would be considered ‘safe’ for my very pregnant friend. I thought it was very encouraging that the staff had the knowledge on hand to address these queries without having to run to and from the kitchen. So I went with the pork chop ($30) and Helen ordered the skirt steak ($26), which came with mash, and then also got a side serve of their Vegetable Barigoule ($7.50). Here’s the only really problem with our lunching experience………… our orders would have been in by about 12.40pm, but the mains didn’t arrive until after 1.20pm….. which maybe wouldn’t have been so bad if the restaurant was full, but given that it is early days, I’d say it was less than half full when we were there. Seemed like quite a lengthy wait to me, but as mentioned it is early days so I’m going to put the timing down to this. And the meals were tasty. 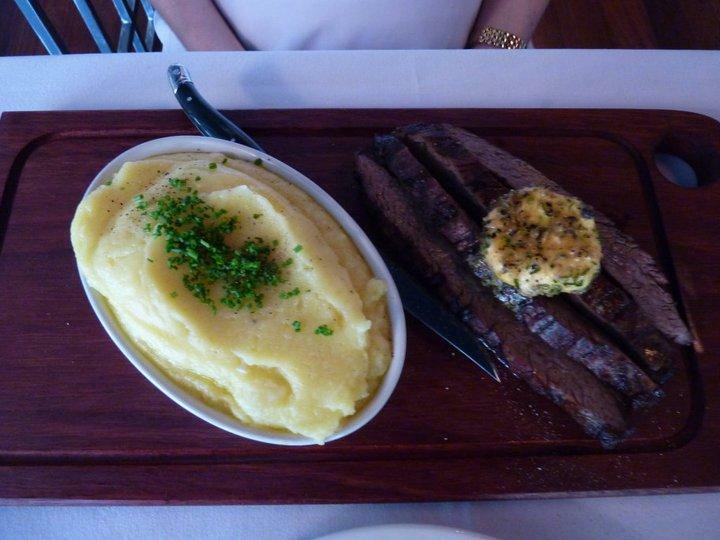 A very generous serve of mashed potatoes came out with Helen’s skirt steak. She mentioned that initially she had thought that the steak looked ‘small’, but suspected that this was likely because it was came out sliced up – it definitely wasn’t small! She also was pleased that despite ordering it well done, that it wasn’t chewy, the Cafe de Paris sauce that she’d gone with was a buttery delight – and was pleased with her decision to go with vegies on the side – a tasty addition – to what was a well rounded meal. 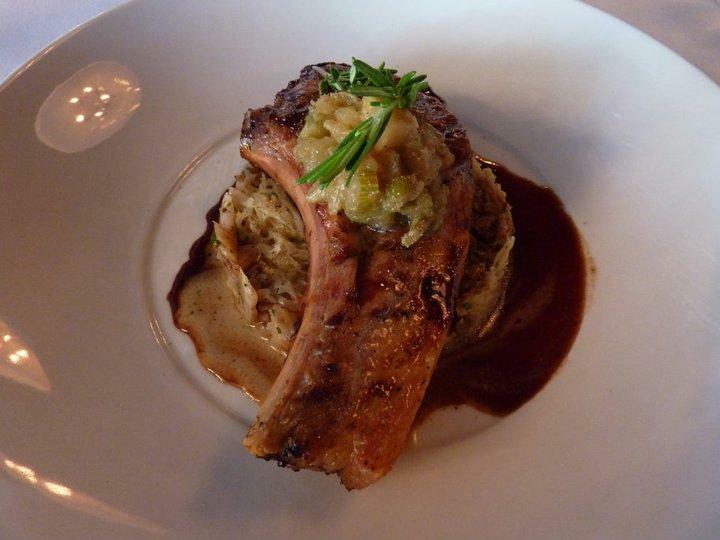 Similarly my pork chop was a generous size – it was a smoky pork chop with braised cabbage and mustard, fennel and apple compote. 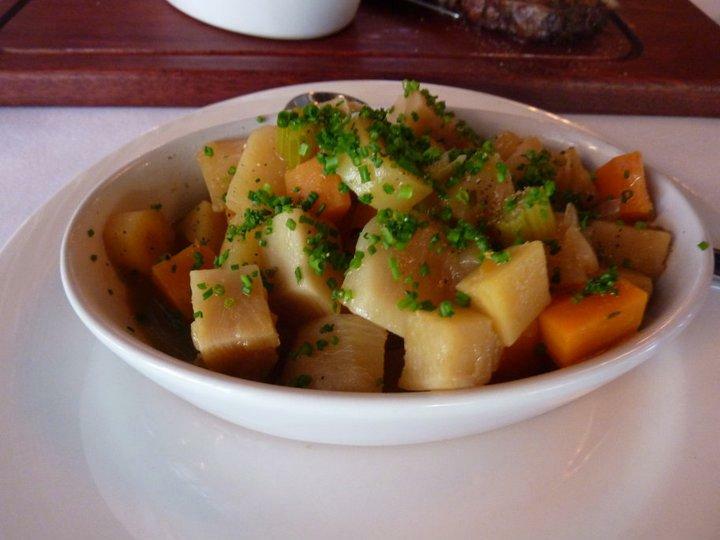 The chop itself had been cooked perfectly, with the right amount of fat to make it really tasty – the apple on top didn’t hurt too, can’t go wrong with pork and apple. I liked the cabbage too – different with the mustard flavouring. I enjoyed it, it was a good filling meal I thought.